Fixed a bug caused Control Panel crash if VAC driver cannot be restarted. Split monolithic cable KS filter into two separate render/capture filters. Added WaveRT (RTAudio) and WaveCyclic port/miniport interface support. Removed 16-cable limitation from the default INF file. Signed with EV certificate to allow loading by Win10 in Secure Boot mode. 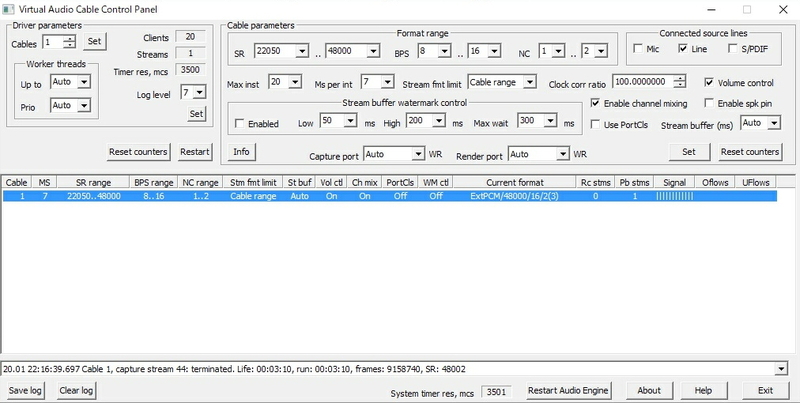 Added load/save configuration features to Audio Repeater. Added actual sampling rate display to Audio Repeater. Added stream's actual sampling rate and run time display to VAC Control Panel. API: replaced CreationTime field in CableInfo with LifeTime to prevent calculation errors.